K.R.Mangalam World School, G.K-II realizes the urgent need to create awareness among its students to address issues of personal hygiene and public sanitation conditions. With this objective in mind, the school organized ‘Clean Your Surroundings Campaign’ on 30 September, 2016 during the school hours in collaboration with NDTV India . 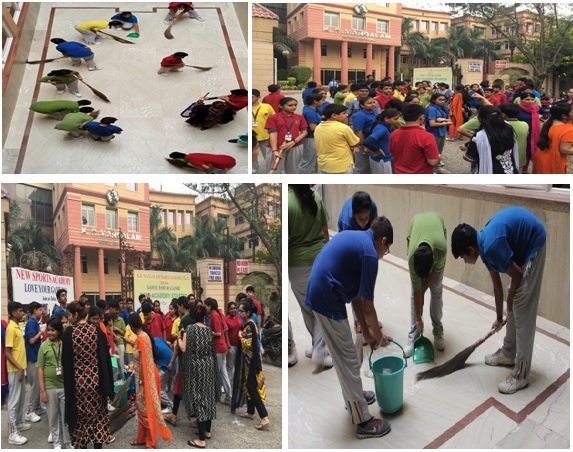 Under the watchful and able guidance of the Principal, Ms Alka Awasthi, the students cleaned the nooks and corners of their school and the immediate vicinity. The drive was one of the many steps taken by the school towards India’s Swachh Bharat Abhiyan initiated by our Hon’ble Prime Minister, Sh Narendra Modi. The students were given brooms and wastebaskets to clean their surroundings. The teachers also contributed unreservedly and led by example. The endeavor met with appreciation and laurels by one and all. The NDTV channel also fortified the effort by telecasting the entire campaign on air on the 2 October, 2016, thereby giving the Father of the nation a befitting tribute.